Available for purchase through Fox Chapel Publishing. Ice Fishing - The Ultimate Guide is the edgiest and most comprehensive guide to help ice fishing enthusiasts catch more and bigger fish. Winter fishing technology and strategies are advancing at a blistering pace and this new 214-page book covers everything from timeless ice fishing basics to the latest techniques. 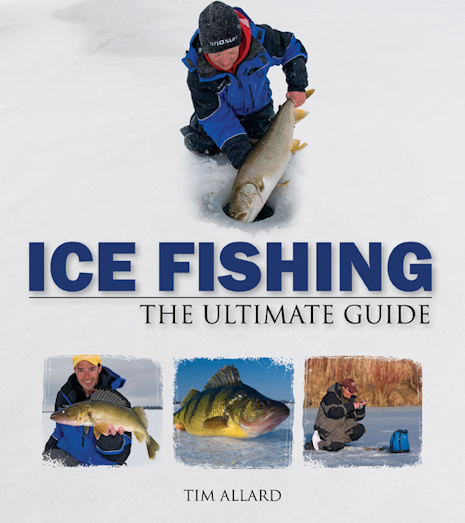 "Whether you are an ice fishing novice or pro, there is something in this book for you," says Bob Izumi, host of The Real Fishing Show. Inside, readers will be enchanted by over 200 full-color photos that portray the spirit and science of modern ice fishing. Part reference guide, part coffee table book, Ice Fishing - The Ultimate Guide is the perfect Christmas gift for any angler, and a great tool for the modern ice angler, says Brian "Bro" Brosdahl, ice fishing pioneer and iconic northwoods guide. Ice Fishing - The Ultimate Guide talks the talk and walks the walk on contemporary ice fishing clothing, electronics, on-the-ice safety, seasonal techniques, the newest gear, and chapter after chapter of species-specific coverage of North America's most sought after fish. Readers will also appreciate the contributions from over 20 of North America's most respected hardwater experts, such as Gord Ellis, Gord Pyzer, Noel Vick, Dave Genz, and Jeff Gustafson, to name a few.